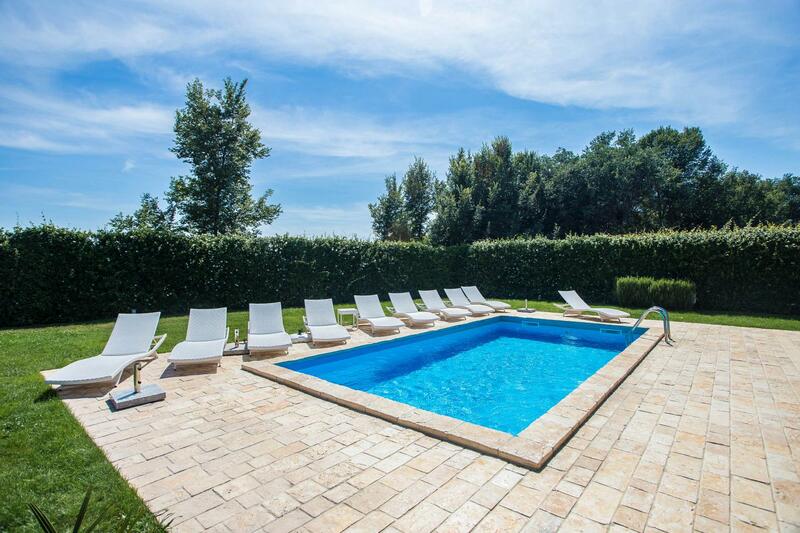 This comfortable villa for 10-13 persons with swimming pool lies in Antonci only 5 km from Porec and from the sea. The villa consists of two units, two typical stone houses equipped with attractive rustic furniture. On a completely enclosed property of 800 sqm, the villa offers to the guests a swimming pool of 24 sqm, spacious summer kitchen with fireplace and sitting area, a separate toilet and parking for four vehicles. Villa Antonio for 6-8 persons of 210 sqm. The ground floor has a living room with sofa, fireplace and satellite TV, dining room, fully equipped kitchen and a separate toilet. On the first floor there are two bedrooms, each with double bed, satellite TV and private shower/toilet. On the second floor is a bedroom with double bed, satellite TV and private shower/toilet, there is also a living area with sofa bed for two persons, satellite TV and a fireplace. All rooms are air conditioned. Villa Antonietta for 4-5 persons of 120 sqm. On the ground floor there is an air-conditioned living room with sofa bed for one person, fireplace and satellite TV, a fully equipped kitchen, dining room and a shower/toilet. On the first floor there are two single rooms with SAT-TV, one bedroom with double bed and SAT-TV and a shower/toilet. Air conditioning for the whole floor is in the hall.